Sarkari Naukri 2018: There is a huge demand for Sarkari Naukri, government jobs among Indian youths. This is because Sarkari Naukri offers great security and stability. Apart from that, these jobs offer a good salary, ample learning scopes, and other benefits. So, every year, tens of lakhs of candidates appear for various exams conducted by various organizations and autonomous bodies on behalf of the Government of India as well as various state governments. These Sarkari Naukri recruitment drives are conducted to fill up vacancies in different posts in various Government departments, ministries, boards, corporations, offices, etc. Lakhs of Sarkari Naukri vacancies are announced every year by bodies like IBPS, SBI, SSC, RRB, LIC, the defense sector, etc. In order to apply and prepare for these exams, you need to have a clear knowledge of the exams which is released along with the official notification of the respective exams. In this article, we will compile the notifications of all the major Sarkari Naukri (Sarkari Jobs) exams. Read on to find out. a. Railway Recruitment Board, RRB in short, conducts exams for recruitment in Indian Railways. There are 21 RRB regions in India and every year lakhs of vacancies are announced for a wide range of posts in these RRBs. b. Staff Selection Commission, popularly known as SSC, conducts various exams for hundreds of posts in various government offices, ministries and departments. Staff Selection Commission (SSC) has 8 regions. Thousands of vacancies are announced every year by SSC to fill up the different posts that come under SSC. c. Institute of Banking Personnel Selection (IBPS) conducts various exams for recruitment of Probationary Officers and Clerks in various public sector banks and Regional Rural Banks (RRBs) in the country. For IBPS Clerk, Probationary Officer (PO), and IBPS Specialist Officer (SO) exams, 20 public sector banks participate. d. Based on the requirement, various banks conduct their own exams. The State Bank of India (SBI) is another bank that conducts its own exams to fill up thousands of vacancies for Clerks, SO, and PO. e. Insurance companies like LIC, OICL, NIACL, etc. conduct their own exams to fill up vacancies of various posts, like Administrative Officers (AO), Assistant Administrative Officers (AAO), etc. f. India Post conducts exams to recruit Postal Assistants, Sorting Assistants, etc. g. Every year, a lot of vacancies are announced in the Defense Services, like Indian Army, Indian Navy, Indian Airforce. The Union Public Service Commission or UPSC conducts the Combined Defense Services (CDS) exam twice a year. h. The UPSC also conducts the Civil Services Exam every year for recruitment in the bureaucracy, like Indian Administrative Service (IAS), Indian Police Service (IPS), Indian Foreign Service (IFS), etc. i. Education boards of the respective states conduct the Teacher Eligibility Test (TET) for the selection of teachers in various government schools run by the respective state governments. j. State-level Staff Selection Commissions conducts various exams for recruitment in various departments under the state governments. k. Various Public Sector Undertakings (PSU) owned by the Government of India (GoI) recruits through Graduate Aptitude Test in Engineering (GATE) exam that is conducted every year. In the next sections, we will provide you with detailed information about these exams along with the exam date and link to the notification of each of these exams. The b, as mentioned above, recruits candidates in various posts of Indian railways, like Railway Group D, Railway Technicians, Assistant Loco Pilots (ALP), Railway Protection Force (RPF), Railway Protection Special Force (RPSF), NTPC (Non-Technical staffs), etc. The board comes under the Ministry of Railways and hence the jobs are Central government jobs. More than lakhs of vacancies are announced every year for these posts in Indian Railways. So, the Sarkari Naukri exams by RRB are great opportunities for aspirants seeking job in Indian Railways. There are posts for candidates of all educational qualification, like Matriculation level, Higher Secondary level, or Graduate level. Staff Selection Commission, known more popularly as SSC, is another organization that conducts a wide range of exams for recruitment in all government departments, ministries, and organizations. SSC conducts separate exams to fill up vacancies for posts of different educational qualification. For example, SSC conducts SSC Combined Graduate Level (CGL) exam for posts that require an educational qualification of graduation. Then SSC Combined Higher Secondary Level exam for posts that demands a minimum qualification of Higher Secondary Level. And so on. Bank jobs are considered to be highly prestigious in India as they provide great salaries, the scope for personal and professional growth and learning experience. Every year various private sector banks, public sector banks, Regional Rural Banks (RRBs), etc. announce vacancies for various posts like Probationary Officers (PO) / Management Trainees (MT), Junior Associates / Clerks, Officer Scale 1, Scale 2, Scale 3, Office Assistants, Specialist Officers (SO), etc. The 20 public sector banks, as well as more than 50 Regional Rural Banks (RRBs) in India, recruits Probationary Officers, Clerks and Specialist Officers through IBPS exams – IBPS PO, IBPS Clerk, IBPS Specialist Officer, IBPS RRB Office Assistant, IBPS RRB Officer Scale 1, etc. – conducted by the Institute of Banking Personnel Selection (IBPS). Apart from these exams, the various banks conduct separate exams based on their requirements. The State Bank of India (SBI) conducts separate exams – SBI PO, SBI Clerk, and SBI SO – for recruitment of Probationary Officers, Clerks and Specialist Officers in SBI and its associate banks. Note that the private sector banks in India too offer almost the same facilities and salary as Sarkari Naukri bank jobs. The Life Insurance Corporation of India, LIC for short, is the biggest insurance company in India. It conducts LIC AAO exam for recruitment of Assistant Administrative Officers (AAO) in various branches of the company all over India. This is the most demanding job in the insurance sector. Apart from this, various other insurance companies, like Oriental Insurance Company Limited (OICL), New India Assurance Company Limited (NIACL), etc. conduct exams various exams to recruit Assistants, Assistant Officers, etc. LIC also has a Housing Finance branch, called the LIC Housing Finance Limited, that conducts LIC HFL exams for recruitment of Associates, Assistants and Assistant Managers. Now that you know about the Sarkari Naukri notification of most of the government job exams, what are waiting for? Finish the syllabus of the exam you want to appear for and take mock tests. Taking bank mock tests will help you in most of these exams as the syllabus is more or less the same for all these exams. As mentioned above, UPSC conducts CDS exam twice every year – CDS 1 and CDS 2. This exam is conducted to select candidates for admission to Indian Military Academy (IMA), Indian Naval Academy (INA), Air Force Academy (AFA), and Officers’ Training Academy (OTA). Apart from that, Indian Air Force, Indian Army, Indian Navy and other paramilitary forces to recruit every year. For example, AFCAT is conducted for recruitment in the Indian Air Force (IAF). Indian Navy too conducts various exams for a wide range of posts. The Union Public Services Commission, popularly known as UPSC conducts the Civil Services Exam every year for recruitment of candidates in the top-level government departments, offices, and ministries. These are the most prestigious jobs in the country which give the selected candidates immense power to make important decisions pertaining to governance. The selected candidates are posted in various services under the Central Government, like Indian Administrative Services (IAS), Indian Police Services (IPS), Indian Foreign Services (IFS), Indian Revenue Services (IRS), etc. Lakhs of candidates appear for the exam every year. Teachers are recruited in various primary, upper primary, secondary and higher secondary schools run by the state governments every year either on a contractual basis or as full-timers. This is one of the most sought-after jobs in India. Every state has their own education board which conducts the Teacher Eligibility Test (TET) to shortlist candidates for the post of teachers in various schools. Each state government conducts their own examination from time-to-time to select candidates for various posts under the state government. A wide range of posts come under these exams in various ministries, departments and offices under the respective state governments. The Graduate Aptitude Test in Engineering (GATE) is conducted every year by one of the Indian Institutes of Technology (IITs). The main purpose of this exam is to select candidates for higher studies in the field of engineering and science. However, various Public Sector Undertakings (PSU), like BHEL, BPCL, AAI, DRDO, etc. which are owned by the Central Government recruits through GATE. PSU Recruitment through GATE is one of the most important reasons why so many people appear for GATE every year. These entry-level jobs have a huge demand among Indians as the salary is high and there are ample opportunities for growth. Most of the Sarkari Naukri exams have more or less the same syllabus. The difficulty level, however, varies. Taking bank mock tests will help in most of the exams. At Embibe, you can take bank mock test series and railway Group D mock test series for free. Make the best use of these tests and ace the exam to get into your dream Sarkari jobs. 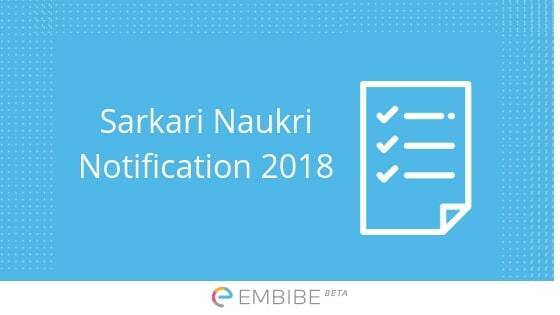 We hope this detailed article on Sarkari Naukri notifications helps you. If you have any query regarding any Sarkari Naukri (Sarkari Jobs), drop a comment below. We will get back to you at the earliest.